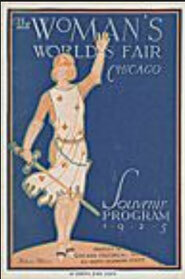 On April 25, 1925, the First Woman’s World Fair closed a successful 8-day run at the Furniture Mart on North Lake Shore Drive in Chicago. The fair, which highlighted women’s achievements in art, commerce and industry, attracted more than 200,000 visitors. The fair was the brainchild of Helen Bennett, author of “Women and Work,” and a pioneer of the women’s movement. In an age when women in the workplace were still considered a novelty, she was demanding comparable pay for comparable work. In the Women’s Republican Club of Chicago Bennett found kindred spirits to support her pioneering ideas – including the Woman’s World Fair. The fair was officially opened by President Coolidge by radio, at that time an almost unheard of feat. The 4-H Club Girl’s exhibit at the Woman’s World Fair was in the form of a miniature household worked out in accordance with 4-H standards for Home Decoration. Miss Maude E. Wallace, Asst. State Home Demonstration agent, North Carolina, was in charge and Inez Harden, National 4-H health champion from Mississippi, Veva Divan, Wisconsin’s champion club girl and third in the national Leadership contest, and Beulah Rogers, member of the National Champion Canning team who won the trip to France in 1922, were present to demonstrate what 4-H Girls’ club work means to American farm womanhood. The exhibit was made possible by courtesy of Montgomery Ward & Company. What the fair proposed – that women question their traditional role in society, discover themselves and seek employment if they so desired – may be commonplace today, but to the women of the 1920’s, it was quite new and radical. For 4-H to have been involved is just another one of those little nuggets of history that always comes as a surprise. This entry was posted in History and tagged 4-H History, Woman's World's Fair by Larry Krug. Bookmark the permalink.